I am not exactly sure how this happened, but Nusara has flown under my radar since it opened. It is right in the heart of the Thai epicenter of New York; Elmhurst, pretty much across the street from Chao Thai and down the road from Ploy. Regardless, it now is on the shortlist. I am not quite sure, but there is something about a good Thai restaurant in this city that you almost can detect before you sit down. It's casual atmosphere, the Thai television programs on, the vibe... you just know. To start, the spicy yum woon sen ($7.95, below) kicked the taste buds into action. At first the dish does not seem so intense, but the chilis eventually catch up to you. The ground chicken and shrimp (I counted two) make a nice alternative to the more popular yum nam sod every once in a while. The ladies here will ask you how spicy you want things on some dishes, a practice I am not particularly fond of, but the good news is that they will bring it spicy if you want it that way. One dish with a pepper by its name on the menu, but fairly mild is the tom yum noodle soup ($6.95, below). I am not quite sure how this became so different from regular tom yum, but I was in the mood for a heartier soup and thus ordered this thicker one. The ground pork and peanuts and opaque broth are great for cold days, the regular tom yum being more of a spicy, make-you-sweat, summer soup. The menu has a few great seafood dishes, and the restaurant seems to feature its whole fish entrees online, but I was not in the mood during this visit, and turned to the curry section to complete my meal. 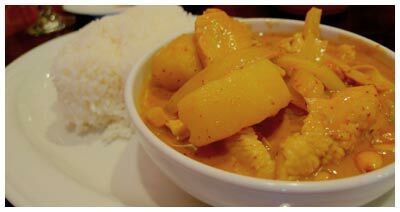 The masaman curry ($6.95 lunch special, below) with chicken was good, but not mind-altering. I am looking forward to trying the others, especially the jungle curry, to see how it measures up. All in all, the place is much less fancy than it appears on its website, and that is a relief, as only Ayada has pulled that off so far. 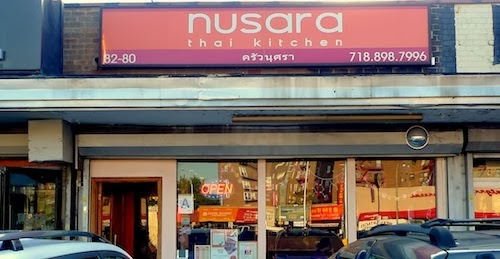 Nusara is a comfortable place full of Thais and excellent Thai food done the right way, and well-priced!